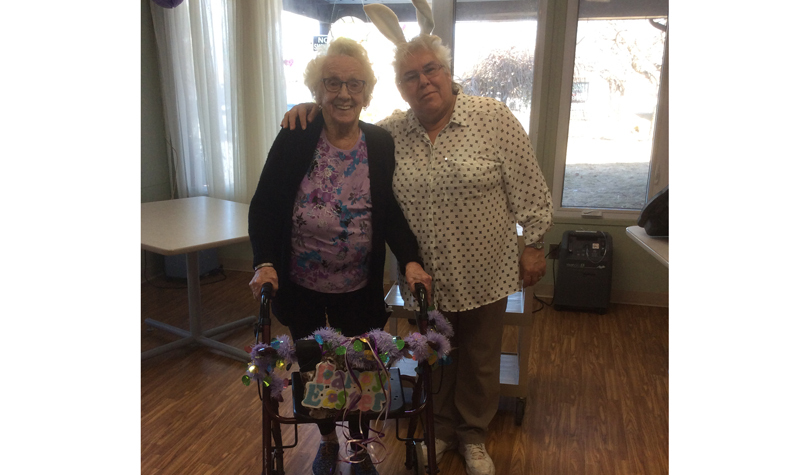 Frost Manor life enrichment aide Delores Pollard is pictured here with resident Dorothy Burrows. Delores Pollard may be retiring on Sept. 21, but the Frost Manor life enrichment aide (LEA) says she plans to continue to come to the Lindsay long-term care home to volunteer and help with special events. Delores has worked 11 years at Frost Manor. Prior to her career at Frost Manor, Delores worked for the Canadian Red Cross and also provided home care. Delores says she will continue to volunteer because she enjoys spending time with residents. She adds that long-term care homes always need extra hands to help out, so becoming a volunteer in her retirement will allow her to fill a much-needed role at the home. Volunteering her time at Frost Manor will be nothing new for Delores, she notes. When she was working day shifts, Delores would often come back on her own time Friday nights to host pyjama parties where she would watch Elvis Presley movies with residents. “They always need a lot of volunteers here for the different things we do, and I enjoy coming in to help,” she says. Delores says she also plans to continue helping residents with other activities they enjoy, such as going to the local bingo hall and taking shopping trips. And there’s one more major event Delores says she’s looking forward to before she retires: the annual three-day camping trip Frost Manor residents will be taking this week. This is an outing Delores has always helped out with. Life enrichment co-ordinator Lyndsay Irwin says Delores is a valued staff member who will be missed, adding the team is happy she has decided to stay on as a volunteer. “We are so sad to see her go but so happy for her as she begins retired life,” Lyndsay says.